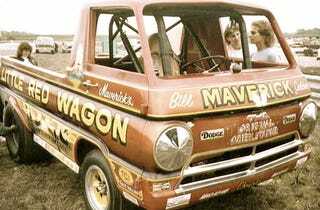 As far as drag racing goes, the Dodge A-100 is famous for two things. The second-most important claim the vehicle can make on quarter-mile history is that it lent its lightweight seats to the Hurst-prepared Hemi Dart. The first, of course, is the Little Red Wagon, an A-100 pickup with a stonking 426-inch Elephant motor stuffed in behind behind the driver. An 11-second machine from its first outing, the truck demonstrated an alarming propensity to carry its front wheels above the pavement, making it one of the most famed exhibition vehicles of the Golden Age of Drag Racing. Hot-cha!